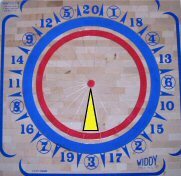 Players shoot three darts per turn. 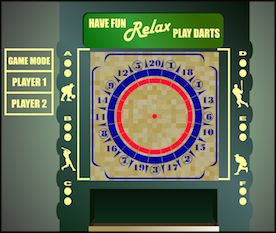 When players are competing, each player throws all three darts and then the next player takes the line. When teams are competing, each player on the team shoots, then the next team takes the line. When sharing the same set of darts, players throw their darts, and the next player to take the line pulls the darts out of the board and calls the score. Players generally do not pull their own darts. When standing at the line to shoot, players remain behind the shooting line. They are said to "toe" the shooting line. The board is broken into pieces called innings. The pieces resemble pie pieces, and extend from the cork in the middle outward through the red ring, and the white ring, stopping at the blue ring. These pieces are separated by strips of metal that are embedded in the board. Each one of these innings is broken into three scoring sections. The first section is the largest, and covers all of the uncolored area between the cork and the red ring. This area is worth one point, and referred to as "the single". In the image on the left, it is highlighted (roughly) in yellow. The second scoring area is the red ring, worth two points. Oddly enough, this area is referred to as "the red". The final scoring area, known as "the trips", is the thin uncolored outer ring. Darts landing in this area score three points each. The blue outer ring is worth nothing at all. The metal strips that divide the innings do not even extend into the blue ring. Total for the inning - SIX Points. 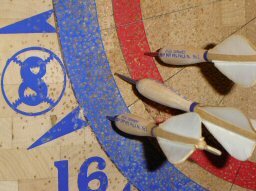 BOUNCE OUTS - Darts must remain in the board in order to count for points. If a dart hits the board, but bounces off, no points are awarded. FALLEN DARTS - If a dart falls out of the board while a player is shooting, those points are lost as well. ROBIN HOOD DART - If a thrown dart sticks into the barrel of a dart on the board (piggy back), it will not earn any points. SPLIT WIRES - The wires that separate the scoring sections on the dart board overlap in some places. If a dart should hit in between these two overlapping sections of wire, splitting them, it is referred to as a split wire. In this case, the score taken for this dart is the higher of the two sections. For example, if a dart splits the wires separating the red and trips sections, the shooter gets three points (the trip value) for that dart. If a dart splits the wires between the trip and the blue section, the shooter gets three points for that dart. FOOT FOUL - When a player stands at the line, the tape should be visible under his foot. If their foot is over the line and they throw a dart, the dart counts. What happened, happened. Foot fouls are like too much pine tar on a bat in baseball. The foul needs to be addressed BEFORE the play finishes - in this case, before the dart is thrown. If it occurs in a tournament, alert the director. If you are the director, simply say that you've "heard word that your foot might be set, or moving forward of the line. Set your foot so we can see the tape, and don't move it". WRONG INNING - It happens. Someone will eventually pay so little attention to the game that they shoot the wrong inning. They do not get the chance to pull their darts and then shoot the correct inning. Next time, pay attention. (Of course, in a friendly game, you may decide to show mercy). 3 AWAY - it is customary for a player to have a chance to warm up before starting the first inning of a tournament match. They simply announce "Three Away", and then throw three darts at whatever. As long as it's not at the 1st inning. Then they pull their darts, go back to the line, and shoot the first. LOSER CHOOSES - In a tournament, teams send players to shoot at the cork to determine who will shoot first or second in the game. Matches are generally 2 out of 3 games. For the first game, a coin is tossed, and the winner of the toss decides who shoots at the cork first. Closest to the cork chooses whether they want to shoot first or second in the match. The loser of the first game chooses to shoot first or second in game number two. The loser of the second game chooses whether to shoot first or second at the cork to decide the shooting order for the final game of the match.